For the most part, I consider myself an optimistic person. Most days the sun is shining, the birds are chirping and I am happy to be alive and experiencing whatever comes my way. But I would be lying if I said that every day is a perfect, happy day. Like everyone else, I have days that knock me off my feet and sour my optimistic mood. Those bad days are the result of worry and stress caused by frustrating situations at work or overwhelming duties at home. As we all know, life can be a challenging at times. Even so, it is critical for your well-being to not let negative emotions fester for too long. Prolonged stress, lingering anger and persistent worry not only take a toll on your mental health, but can also affect your physical health. 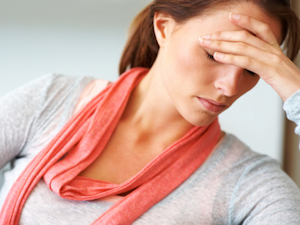 Studies have shown that people are more prone to sickness when they are chronically stressed. That is why, when I start feeling stressed or irritated, I try to be proactive. Here are five things I do to overcome negative emotions. Exercise: When you perform a physical activity, such as running or bicycling, it helps to release feel good hormones called endorphins. These feel good chemicals will naturally improve your mood. Meditate: Meditation clears your mind, helping you to process and minimize the negative emotions. It also relaxes your body and brings it to a calmer state, thereby reducing the negative physical effects caused by the “fight or flight” mode that you were in before. Make a decision: Sometimes unhappy emotions stems from being indecisive. Figuring out what is making you unhappy and doing something about it, will empower you and improve your mental state. Get perspective: How you see the world can shape your mood. For some, even sunny days feel dark and cloudy. Think of all the positive things in your life and the struggles that others have. Putting things into perspective can help you see that your life is not as bad as it feels in the moment. Redirect your thoughts: STOP dwelling on the things making you unhappy and redirect your thoughts to something more positive. Watch a T.V. Show, take a nice hot bath or read a good book. Getting your mind off the negativity will lift your mood. Everyone experiences negative emotions, but the goal is to do something about it and not let it take over your life. Unhealthy emotions hold no benefit for you and can only damage your health. So, stop wasting time being negative and don’t miss out on life. After all, it does have a lot to offer! When you are down you have to keep in mind what is important in your life. Concentrate on the good things. Do something that relaxes and gives you enjoyment.